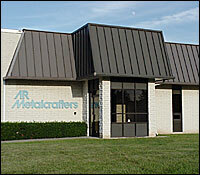 Founded in 1967 in Philadelphia and now located in Montgomery County, Pennsylvania, AR Metalcrafters has a long-standing good reputation in the sheet metal fabrication industry. Located in the Delaware Valley region of Pennsylvania, just 30 miles north and west of Philadelphia and convenient to most U. S. East Coast transportation routes, we service a geographically diverse group of clients locally and throughout the United States and Canada. AR Metalcrafters has a long year history of excellence in sheet metal design and fabrication, with over 30 years of experience. From the start of our predecessor company in an industrial section of Philadelphia to our present 20,000 sq. ft. facility in Kulpsville, Pennsylvania, we’ve grown and prospered by providing excellent products, value-added services, and reliable production, on-time deliveries, and outstanding customer service. Equipment blending CNC and manually operated work centers. Use of Lean manufacturing to streamline our operations. State of the art production management software for tracking jobs, costs, and scheduling the factory. From the main east-west Pennsylvania Turnpike, follow signs for the Northeast Extension (Interstate 476 North). Travel 10 miles to the first exit, #31 Lansdale. After exiting the toll booth, turn right onto Route 63 and travel to the 2nd traffic light at Wambold Road. Turn right onto Wambold Road and go 1-1/2 miles to Fretz Road. Turn right onto Fretz. The entrance to our building is the first driveway on the right.